Those who love tennis want efficient practice time. Owning the proper equipment can improve efficiency. As simple as it sounds, choosing a great ball hopper can make your practice time run much more smoothly. What Can a Ball Hopper Do for My Game? 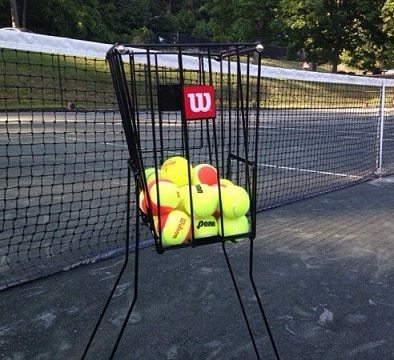 There are five top-of-the line tennis ball hoppers you may want to consider. Each has advantages and disadvantages, so it will serve you to pay attention to the features of each. This product is versatile for several types of sports. It is also durable as it has stainless steel arms and pick up ring. The arms are locking and the bucket also has heavy duty springs, so it will last as a stand. This ball hopper has something others don't, a molded plastic grip and a padded lid. This makes carrying it and using it to pick up balls more comfortable. 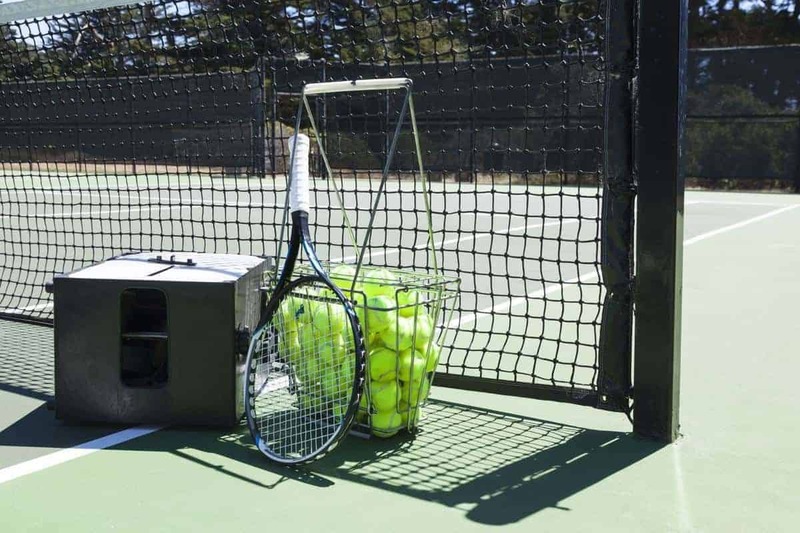 This six-gallon device holds 90 tennis balls, or if you wish, 60 baseballs or 26 softballs. It does pick up all of them, and most other balls too. The one ball is doesn't pick up is golf balls. 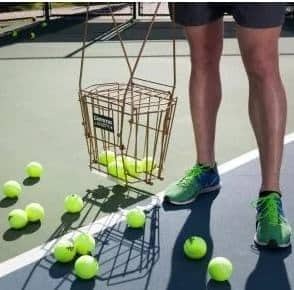 This large capacity hopper holds 85 tennis balls, but does also work with other balls that are not regular tennis balls. It will pick up low compression Stage 1 and 2 balls as well as large Stage 3 Red balls. It has a fixed handle with no moving parts and is made with a heavy gauge steel wire and black coated finish. This makes it incredibly durable and able to withstand extreme weather without chipping or fading. It has a heavy duty construction that makes it sturdy and durable. Tourna is a name brand, so its products have a solid reputation for quality. 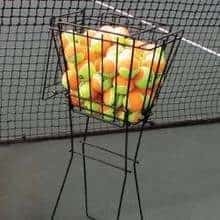 This cart is for those who plan on spending a lot of time on the court as it holds 150 balls. It would be the perfect choice for someone coaching students or a pro. It has four-inch wheels that are rugged and smooth rolling. It also has a bottom tray made of mesh that is removable. The mesh helps divide transition balls allowing for quick start tennis. While it is one of the larger capacity ball hoppers, it folds down to only 43 inches. It also has a hanger on the front for the compatible ball basket used to actually pick up balls, which you will need to buy separately. The basket is made of the same sturdy material and both are black powder coated to withstand weather. It does not have a lid. 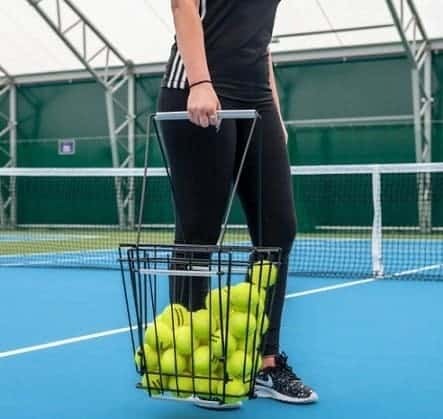 This tennis ball hopper and stand comes with a large capacity basket that holds 72 tennis balls. It easily folds for transport or storage and lays flat, which its best feature. Those who would like this product are people who don't have a lot of storage space and want to quickly move from the car to serving on the court. The stand easily rotates to become handles without a problem locking or unlocking. The powder coated steel structure is weather proof, making it a good product for those living in harsher environments. It is constructed to pick up balls easy with only a little pressure and you can get to the balls just as easily with an easy open lid. This is a good product for those who may have some physical limitations, but who want to stay in the game. This product will hold more than 70 balls, but only works for tennis balls. The bucket is a standard size and the height reaches to an average adult's waist. One of the best features of this product is its easy assembly. It is also easy to store. It does work as a stand with lockable legs, although some say both locks on both legs don't seem to work well when the basket is full. It is made of sturdy construction, is relatively light and has a black powder coat. The one flaw of this product is in the assembly instructions. Assembly is easy, but the instructions can be confusing. There are reasons why those serious about tennis buy ball hoppers. The primary reason is it improves efficiency. A good ball hopper allows you to quickly restock and continue practice. A second reason for owning a ball hopper is to prevent back strain. Picking up 80 balls by hand, constantly bending over, could easily strain your back as well as take up valuable practice time. A ball hopper keeps all your tennis balls together to transport to the courts and store at home. All of that helps in create an effective practice session. Every piece of equipment you own will contribute to your practice, and ultimately, your game. So, you need to pay attention to the type of equipment you buy and buy the piece of equipment that works for you. That means you will need think about your individual needs and do a little research before you buy. The weight of a ball hopper is one of the more competitive markers between today's top products. A lot of tennis players want lightweight hoppers for ease of use. Since there are many types of metals, plastics and other materials out there for manufacturing, there are an array of lightweight ball hoppers on the market too. However, being lightweight doesn't always mean it is durable. Durability is the second aspect of choosing a great ball hopper. This is especially true if you plan on getting serious about the sport and want to spend a lot of time on the court. This is an investment, although a small one, and you don't want to have to keep buying ball hoppers throughout the season. One of the biggest differences in ball hoppers is the stands. Having a solid stand that can withstand weather on a bad day is important. The other important aspect is having a stand that suits your height. You want to be able to easily grab a tennis ball for a serve without a lot of bending over. Stand height is also important if there are children playing the game because you don't want them have to reach into a stand that is too tall for them. Price is the final differentiating marker between the various ball hoppers. While many of them are, generally, within the same price range, some are more expensive than others. You will need to decide on the balance between the price and value. There are a couple of issues to consider when looking at ball hoppers. One is the number of balls each carries. If you don't plan on staying on the court for an extended period of time, a mini ball hopper that holds only 40 balls may be right for you. Also, if carrying 70 to 80 balls to the court or car is too much weight for you because of physical impairments, then a mini-hopper may be a good choice. However, players wanting an extended practice without continuously picking up balls will want to consider a larger bucket that holds 70 to 80 balls. These larger tennis ball hoppers are good choices for the majority of those who love the game. The other primary factor to think about is whether tennis will be the only use for this equipment. If there are several family members involved in many sports, you may want to consider something more versatile. There are new ball hoppers that can be used for a several sports and one of those may fit your needs better than a traditional hopper. Any product you choose should be a safe one. That includes two primary areas, the stand and any latches. The stand should be durable and not easily tipped over. It should have locking legs You don't want it to fall on your leg should there be a big gust of wind. Any latches should catch well, but not able to pinch fingers. The top should be easy to open to retrieve balls. This is especially important if younger children are using the equipment to practice. Most products do have safety ratings, so be sure to look for one. Also, look to see which products are recommended for younger players as some are geared toward students rather than adult pros. This is important when considering height and weight of the ball hopper. Some have long handles, making for a taller stand. That also means it will be taller when picking up balls. Those who have different family members using the ball hopper may have a problem using equipment made for taller people. You want a stand that requires little bending over for anyone using it, so be sure to check out the height for use as both a stand and pick up. Also, be sure the pick up is easy and requires very little pressure. You don't want to have to continuously push down to retrieve tennis balls. This may be an incredibly important aspect to those who are older, disabled or have some other limitation that makes it more difficult to play. Many of these products do require assembly, so the ease of putting them together is something to consider. The biggest complaint of products requiring assembly is the instructions. Either instructions are not included with the product or they are not easy to understand. The best way to handle that is to ask if instructions are included and question the ease of reading and understanding them before purchasing the product. There are companies that have been a part of the tennis world for decades. Then, there are upstarts who are making a name in the market. There is always debate about which is best. The way to choose between the two is to simply look at the reviews and evaluate the product. It is true, the highest reviews tend to go to the brand name items. However, there are solid reviews for some of the lesser known brands as well. It may pay off to scroll a little further to see what is out there. Some of the lesser known brands are being creative in their products and offer some features the traditional companies have not caught onto yet. Clearly, there are many choices of tennis ball hoppers and everyone has their favorite. For the money, the one from this group that has the highest quality versus value is the UpBucket multi-ball hopper. This product is the right piece of equipment for those with children in multiple sports. It is durable, safe and has sturdy legs that lock into a solid stand. There is no assembly and it has tremendous ease of use in picking up balls. It stores and transports easily as well.